It was apt that the latest lady to cruise the Rhone was launched in March by none other than French actress Catherine Deneuve. As well as being named after the star of more than 100 films, including Belle du Jour and Indochine, the river cruiser shares a glamour that harks back to a more pampered age. Sold exclusively in the UK through Titan Travel, the newest addition to the fleet of Uniworld Boutique River Cruise Collection, the SS Catherine takes the design aesthetic from sister ship, SS Antoinette, and runs with it. It has a lot to live up to – the Antoinette has been called the best river cruise ship in the world. As well as being one of the largest luxury ships in the collection with an impressive length of 443 feet, the Catherine is one of the most considered with exceptional attention to detail. Every aspect on the vessel was envisioned by Uniworld’s design team led by Beatrice Tollman, founder of Uniworld’s sister hotel company, Red Carnation Collection, working with her daughter Antoinette Tollman and Brian Brennan, the group’s project director. The basic facts state that the Catherine offers 79 staterooms, five luxury suites and one Royal Suite. It has a maximum capacity of 159 guests and 57 staff members. However this does little to convey what is on offer aboard this supreme vessel which embarked on its maiden voyage through the regions of Burgundy and Provence in Southern France on 27 March. To begin in the heart of the ship which Brennan envisaged first, the lobby centrepiece is a regal glass elevator with a whispering waterfall cascading down one side of the glass. An opulent Murano chandelier was commissioned exclusively from Arti Veneziane alla Giudecca in Venice and immerses the room in a soft, romantic glow. Throughout the ship is decorated with handpicked antique furniture, paintings, mirrors and objet d’arts inspired by French elegance. Around $2 million was spent on the artwork that graces the walls, including various pieces from the artists Jane du Rand and Rene Rutgers. So it’s no surprise that the lounge is named after Van Gogh. The Dutchman painted many of his best known works in the South of France although the poor impressionist would scarcely recognise the luxury he lends his name to. The area is bathed in pastels with brass accents, French wrought-iron gates and more antique furniture. Not to be outdone, the Cézanne Restaurant features high-lacquered blue-green walls above vivid blue, green and white striped carpeting with blue velvet banquettes from which to peruse the room’s art. An al fresco terrace provides another option for guests, and a separate bistro restaurant offers a relaxed and cosy atmosphere. The Leopard Lounges found in some Red Carnation Hotels are referenced in the Bar du Leopard where guests can relax over a glass of champagne while taking in the playful leopard-print furnishings, elephant-head bar rails, wood panelling and jungle mosaic. Rooms are individually decorated and feature handmade Savoir of England beds and marble bathrooms. All suites and staterooms on the top deck offer full open-air private balconies which convert to enclosed conservatories with the touch of a button. Staterooms on the middle deck feature French balconies. Singles can choose a single occupancy stateroom with no supplement. On a more prosaic level, the ship’s bio-diesel engines are eco-friendly. This may mean little to the well-heeled baby boomers Catherine is designed to appeal to, but it demonstrates an appreciation of protecting the environment that the ship exploits. And make no mistake, the itinerary itself is something to be appreciated. Uniworld has designed an imaginative schedule that also has the tailor made touch. Guides are hand-picked for their expertise and they work exclusively for Uniworld. On some tours you will even be invited into the homes of the guides. Highlights include Avignon, Arles and the wine capital Beaune. Back on board service is the key to the Catherine experience. Staffing levels are higher than average and they go the extra mile. From the personal butlers to the complimentary champagne, everything has the air of luxury. Throw in a mosaic-tiled resistance pool and Serenity River Spa treatments, which can be taken in the spacious cabins, and you have a recipe for relaxation. The only thing that could possibly keep you awake is how Uniworld will top the Catherine. It is launching the SS Maria Theresa in January 2015, so let’s see. • All Suites and Category 1 staterooms and have full open-air balconies that with the touch of a button raises the glass to create an enclosed conservatory. • Category 2 staterooms on this deck have French balconies. 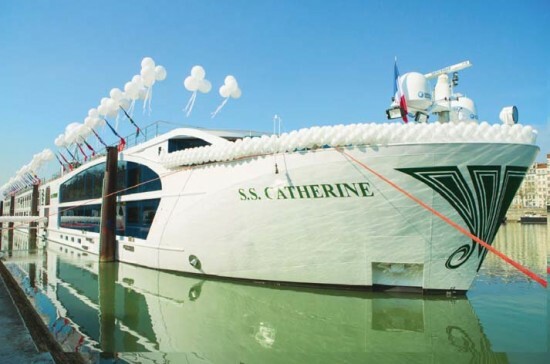 The SS Catherine will sail the regions of southern France on the 8-day Burgundy and Provence itinerary. Prices start from £2,749pp (based on 17 August 2014) including flights, full board accommodation, transfers, unlimited beverages on board, all gratuities on board and ashore, excursions, English-speaking local guides, complimentary internet access and Wi-Fi on board and Titan’s VIP Home Departure Service.